Welcome to Carolina Beach! 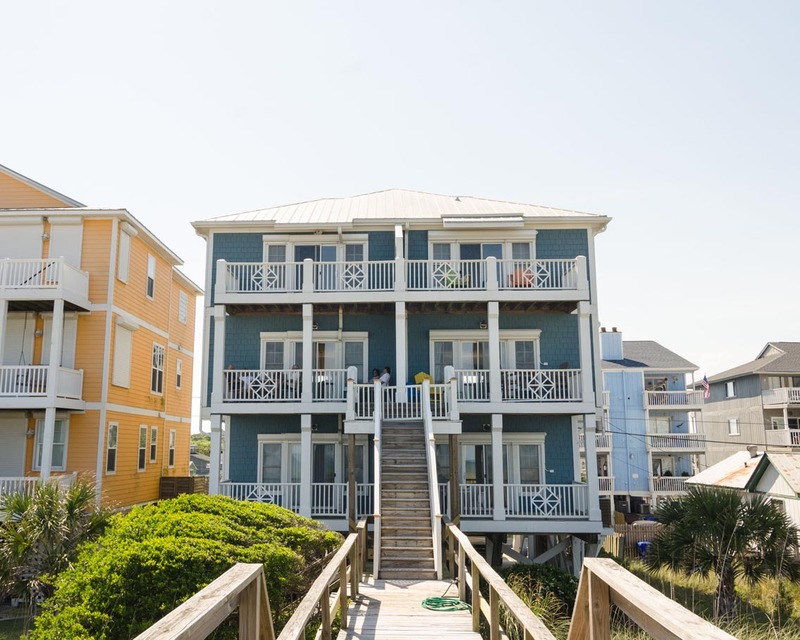 This lovely four-bedroom, three-bath oceanfront duplex is six blocks south of the Carolina Beach Boardwalk, and comfortably sleeps ten people. It has three levels, accessed via stairs or an elevator. 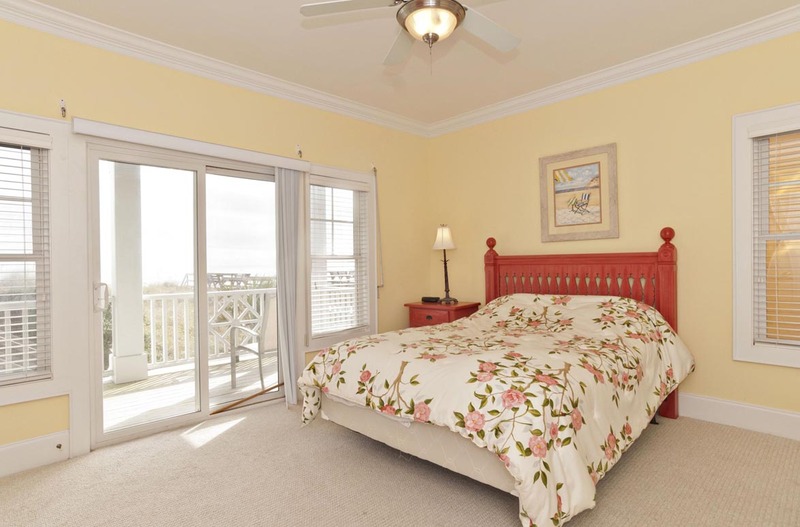 The lower level has one oceanfront bedroom with a bath and one street-side bedroom and half bath. The main level is where you will find the fully equipped kitchen, a half bath, dining area, and living room with private deck. Spectacular panoramic views of the ocean are visible from the open design of this home. The third level has an oceanfront master bedroom with a private bath, and an additional bedroom with a private bath. 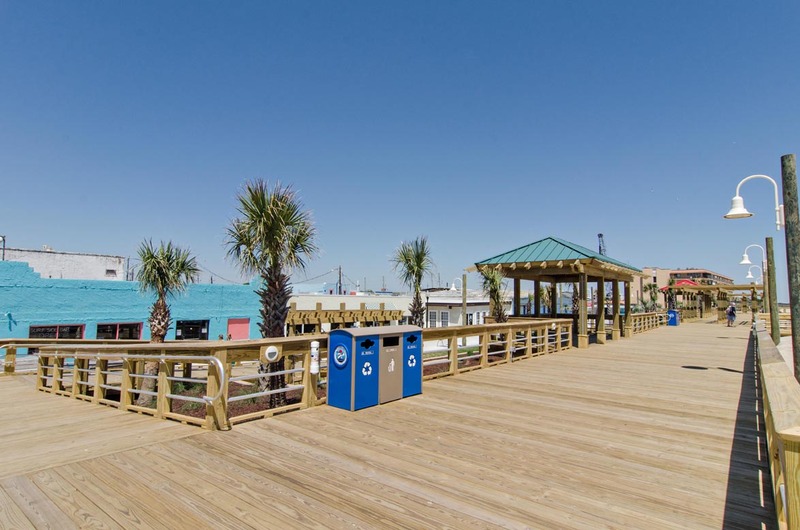 While in the area, be sure to check out the Carolina Beach Boardwalk, where you will find shops, restaurants and the summer activities such as fireworks, carnival rides and live music. Watch the fishermen come in with the catch of the day at the marina or dine out with the family. 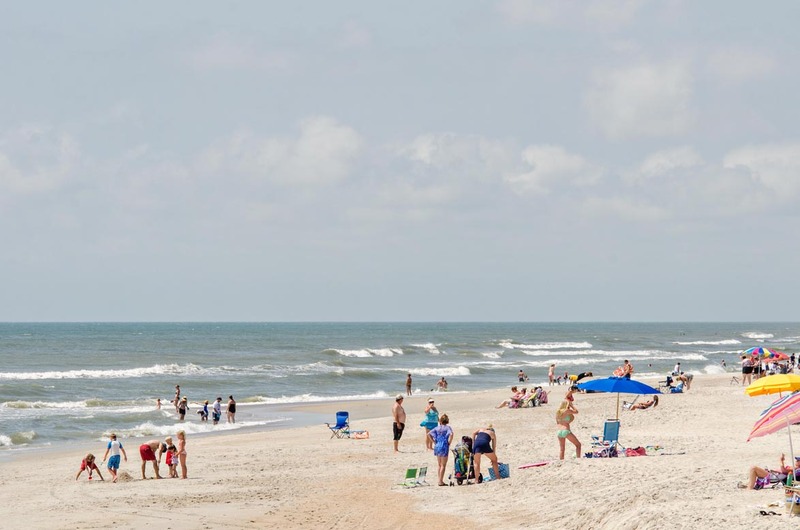 Make plans today to stay in beautiful Carolina Beach! This is a non-smoking duplex. No pets are allowed. We had perfect weather and ocean conditions for our 3 generations. Grandchildren were 5, 2, and 11 months. Our family loved their stay. Location relative to things to do is excellent. Oceanside location is outstanding. Clean, safe, great beach. Minor issue with fridge, but resolved. All things considered, we had a very nice winter holiday vacation for a week at this beach house. So nice to be right on the ocean, where it wasn't too cold to stroll along the beach on most of the late-December days. The ocean views from the beach-side rooms were very pleasing. The rental agent dealings went smoothly. The house was in good shape, and clean. The only complaints dealt with a couple of maintenance items. The primary one would be that the vertical wood slats on the outside handrail going down from the main living room/kitchen floor to the boardwalk to the beach were in need of maintenance/repair. Several vertical slats were missing and some were rotted. That was of concern because we had a 4 and a 6 yr old in our party. Also, why have a tub in the upstairs (street side) room bathroom if there is no plug to hold the water in. I bought one for the tub. Overall, for sure a great rental experience that I would recommend for others. Hi David- thank you for your feedback! We are so glad you enjoyed the unit and its location. We are also glad to hear that we were able to be helpful to you during your stay! As for your maintenance suggestions, we will certainly pass those along to our maintenance department and the property owner. The off-season is the perfect time to update things like this because we have a little more time to get in and work. Also, thank you for your contribution to the upstairs tub! In the future, we hope you will call us for things like that- we would have been happy to pick one up and bring it to you! Thanks again for getting in touch- we hope to see you back again soon! Hi Cindy- thank you for your feedback! We will be sure to pass your comments along to maintenance to address these issues. Thanks again- we hope to see you back at the beach again soon! The house itself was very nice. We were there for a short couple days for a college visit to UNCW. We were a bit disappointed in what was provided by the rental company for the cost of the rental. How much could it possibly cost to provide little bars of soap or shampoo? We rent routinely in Isle of Palms, SC and we are provided a renters packet with a mini dish soap and soap for one load of the dishwasher. We had nothing to even run the washer when we left. Agreeing with a previous review, the balcony off the master had a number of loose and old decking that should be attended to. On our day of checkout at precisely 1000 when we were trying to get out of the unit, there was an elevator repairman show up. I asked if there was a problem and he answered, "No just doing a routine check". We had luggage to get out and had to struggle down the stairs because of this. Knowing they had renters there, they could have been courteous enough to wait until 1030 so we could get our things out. Hi Sheri- thank you for your feedback! We are so glad you enjoyed the unit. I'm sorry to hear there was no pod for the dishwasher left in the unit for you- we do typically provide one for every reservation. I will certainly put in a service order for the boards off the master balcony. I also apologize for the elevator vendor. While that is out of our hands- we do not schedule the regular elevator maintenance- they should have waited until the property was vacant. However, we are glad that you liked the property overall, and we hope to see you back at the beach again soon. Thanks again! We loved the condo! Our group consisted of brother and sister with father and his wife. We all had enough private space, along with the wonderful living/kitchen area to be together. The view was spectacular. The proximity to the ocean was also great. The property's boardwalk itself needs a bit of attention. Carpets could use a cleaning/replacement. Lower level bathroom needs updating to equal the mid and upper level bathrooms which were great. 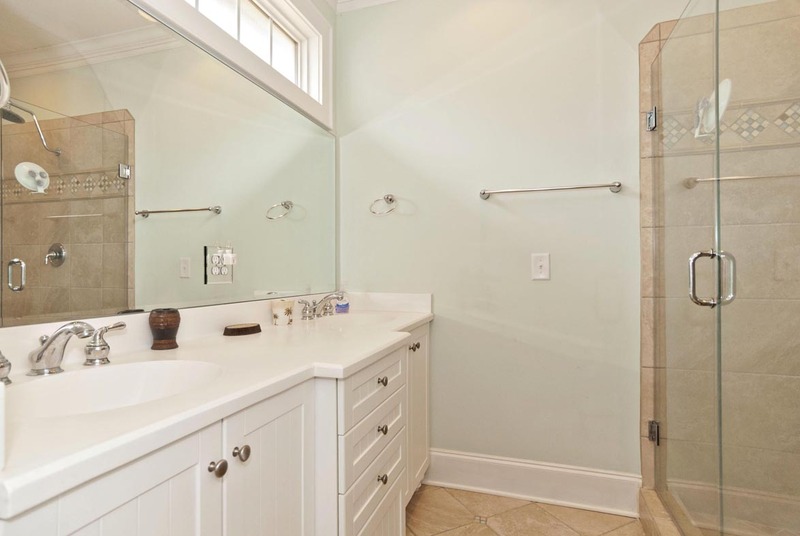 Loved the floor layout in the great room/kitchen space-powder room was so handy. Mostly cosmetic concerns but location was superb. Bryant did an excellent job with all of our questions throughout the process from locating the property to moving in/out and providing local points of interest and dining options. Bryant also coordinated the use of rental umbrellas and chairs making it a one-stop-shop. Thank you for your review and compliment to the Bryant Real Estate Staff. The carpets and the furniture have been cleaned. Beautiful location and property. All was organized well by Bryant. However, the property was not up to standard expected. It was in need of several small repairs which I did - Fixed sliding screen back to track, bought WD-40 to fix main door latch, repogrammed TV controller to link with TV, etc. Bryant responded immediately to fix AC problem. Hi Kurt- thanks for your feedback. We are glad you enjoyed the unit and your stay, but we are sorry that you were on repair duty! Unfortunately, we were unaware of these issues, or else we would have fixed them prior to your arrival. Please note that we do have maintenance and housekeeping on-call 24/7 to address any issues that may arise during a stay. I am glad to hear that we were able to repair your AC! Thanks again for your comments- we hope to see you back at the beach again soon! Thank you for your feedback. We are sorry that the internet went in and out on you. The properties are spring cleaned every year and we have had the furnishings and carpets cleaned again. We hope that you had a nice vacation and we look forward to seeing you next year. At the urging of our 3 1/2-year-old grandson, we booked “his” vacation house again this year, despite our mixed reviews last year. We arrived this year (for a 2-week stay) and found that the house’s overall appearance of cleanliness had somewhat improved over last year. Having said that, the overall condition of house is showing its age. In particular, the exterior decking/railings looked in need of attention (worn decking with lots of nail-pops and loose railings/missing spindles - disconcerting for small children or those with physical challenges). As it happened, we chatted with the visiting owners of the attached house, who indicated that they and the owners of our house were planning to make improvements to the [common] exterior/decking for the coming season; this would be a major selling point to me for another visit. Overall, our stay was fine. The house met most of our needs in terms of location and amenities. We noted that the patio table was the same, weather-worn one as last year. Because it was nearly impossible to keep a coffee cup or wineglass upright on the table, we decided on day 2 to visit the nearest Lowes and buy a new one (we found a nice sturdy table which matched the decor for $70 - a worthwhile investment/donation for the amount of pleasure it gave). We also brought a couple of extra folding chairs with us this year so that there was seating on the lower/upper decks for guests staying in those oceanfront rooms; it’s a pity these are not provided as a basic amenity. This year, there was a new exterior lock on the main deck patio sliding doors which caused inconvenience since it was impossible to lock/unlock from the outside. The sharp threshold stripping was also loose on that patio door. Most of these things should be fixable. Ms. Christian, We appreciate your feedback and continued patronage. We are glad to hear that the unit has been improved since your last visit; also, that our maintenance team was very responsive in addressing your concerns. You are correct, the owners are aware of the deck condition and are coordinating these repairs with the neighboring rental unit. We are glad to hear that you enjoyed this wonderful home for a second year in a row and look forward to having you again next year to enjoy the improvements! Accommodated us in short notice, fixed a couple of problems quickly (wi-if and cable) and verified they had taken care of AC "mold" complaint from previous comments, which turned out to be rust on the vents. We would stay there again... the only thing they need is patio furniture on all of the decks. Located by the veggie wagon which is a plus! Hi Elinor- thank you for your feedback. I am so glad to hear that you enjoyed your stay and the unit! It is a beautiful home, and we will be sure to speak with the owner about the possibility of new patio furniture. Thanks again- we are looking forward to hosting you again soon! Wonderful, had a sit down dinner for 18 and the place was great. Amazing experience! Best location and stay! Had an incredible experience at this location. Very easy check-in and check-out process. Location was very clean and it felt like home. Would definitely recommend. Very spacious as well. House itself was beautiful, in a great location. The furnishings were okay, however there was no DVD player that we could find anywhere and my guests brought and bought movies that we didn't get to see...would be nice to have some deck chairs for the third level deck. Advertised outdoor shower, but just a hose. Overall very good experience, and I would rent again and recommend to others! This property is in an ideal beachfront location. 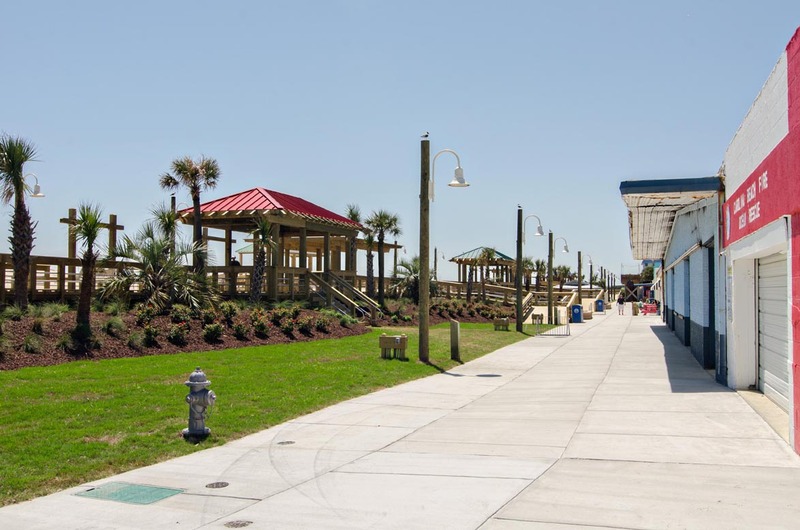 It is within walking distance of a small boardwalk with rides and games for children and some restaurants and bars for adults and families. A/C was not working when we arrived but problem was corrected within a few hours. Decor is nice and kitchen is well stocked with most things you need if preparing meals. A short drive to Wilmington offers shopping, restaurants and interesting sights and entertainment for the whole family. Shelia- Thank you for your feedback, we are glad to hear your time at the beach was enjoyable! Hope you'll visit again soon! We had a wonderful vacation. The place was newly painted and being on the beach was perfect. We even had a great view of the Thursday night fireworks from the deck! Thanks for sharing your place! WI-FI and Internet did not work but you send some one to fix it but we used our next door neighbor's password and it worked.